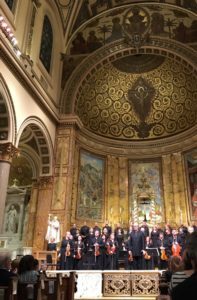 The Estonian Philharmonic Chamber Choir, Tallinn Chamber Orchestra and conductor Tonu Kaljuste bow at St. Ignatius Loyola in New York. Arvo Pärt, disarmingly, lacks barriers. He hides nothing. Evasion, irony and pretension are unknown in his music. Arvo Pärt: The Sound of the Sacred — a concert on Nov. 12 at the Church of St. Ignatius Loyola in New York — changed my long-standing ambivalence with an authoritative encapsulation of Pärt’s output. The performers were the Estonian Philharmonic Chamber Choir and the Tallinn Chamber Orchestra under the long-trusted conductor Tõnu Kaljuste, who has furthered modern music in the Baltic republics more than most anybody, and who is so close with Pärt that they live in adjacent apartments in Tallinn, where you’ll see street musicians from as far away as Spain who come to Estonia just to breathe Arvo’s air. The program — presented in a series known as Sacred Music in a Sacred Space — began with Pärt’s early-1990s Berliner Messe and included the US premiere of Prayer (with a new string orchestra accompaniment) from his magnum opus Kanon Pokajanen and the 2009 Adam’s Lament. One hears no typical compositional progression over the decades: Pärt inhabits whichever region of his world seems to be dictated by the nature of the piece, with that nature often defined by the choice of text. To my ears, at least, words are essential to Pärt. His instrumental works still don’t speak to me. (In the strings-only Silouan’s Song, I just heard slow-motion outtakes from “Eleanor Rigby”.) This program included texts in Latin, Old Church Slavonic, Russian, and even, in the unidentified encore, something unknown (overheard while leaving the concert: “What was that? Old Church Slavonic?” “No, something else …”); Pärt has also written works in German, English, French, Spanish, and Italian. While some composers, such as the late John Tavener, might choose a language (Greek, Church Slavonic, Arabic, Sanskrit) for what it represents as much as for what the words actually say, listening to Pärt tells me that, on a deeply intuitive level, he chooses words and language for the sake of the music they yield. The forms Pärt chooses don’t fit neatly into typical program slots, one reason why you hear rarely hear his music in mainstream symphonic or choral concerts. In most of the works on this program, he set traditional sacred texts, but not in the kind of long forms that compete with, or even complement, Bach, Mozart and Verdi. (It’s true that Pärt has set a Passion text, but in a way that’s so much his own that I can’t equate it with any other Passion that has come before it.) Long stretches of the 2001 Salve Regina (heard on Monday in a 2011 arrangement) defy the usual lyricism associated with that text, with long, contemplative, a-melodic passages for the choir and instrumental writing that’s full of activity, including an out-of-left-field celesta. So many of Pärt’s vocal pieces are relatively short that the unbroken 26-minute duration of Adam’s Lament (whichthe program) feels downright epic by his standards. There’s another factor that makes Pärt performances problematic on mainstream programs. Because the scores are so punctuated with silences, there are many entrances that come out of nowhere with unusual chord voicings that are hard to nail on the first try. And if every entrance isn’t nailed, the music’s spell dissolves. Yet skilled, busy professionals who can nail the notes run the risk of only seeing the simplicity and modesty of the music (“oh, this’ll be easy to rehearse”) and missing the meaning released by that modesty. With Pärt, performance energy can’t be superficial; the music must be fired from within. Pärt’s dependence upon silence as a compositional element and stillness as an aesthetic had convinced me that his music was best heard in strictly controlled environments, such as via recording, using headphones. (Audience noise dissolves the music’s spell just as surely as any un-nailed entrance.) Yet many of his pieces demand that you be in the same room with them. The excruciating ecstasy of Prayer lacks the penetrating, enveloping, downright tactile impact on a recording. The overwhelming anguish of Adam’s Lament (which is about the original Adam, yes, that Adam, grieving over his alienation from God), heard in person, is communicated with depths that a compact disc can’t touch. Kaljuste’s performances hit upon an ideal — technically, cognitively and acoustically. But how often can we hope for that?